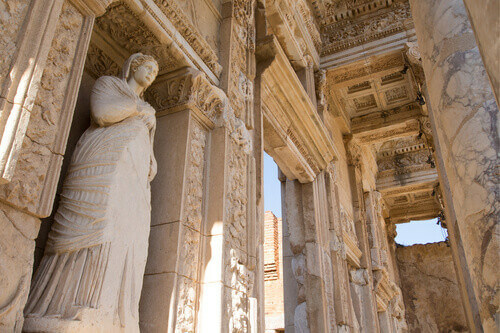 A classical city like no other, Ephesus was one of the largest cities in the Roman Empire and retains much of its rich history from that period, in addition to the monuments during the Greek and Byzantine periods. 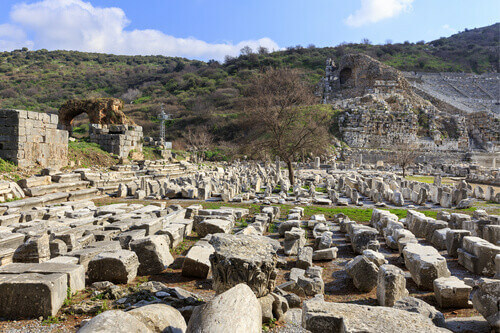 Its coastal location makes it easily accessible to visitors, while its compact layout means that you can easily navigate Ephesus on foot. Walking tours are available from about TL70 (AU$18) but it is also straightforward to start at one of the city’s ancient gates armed with a guidebook and go exploring, following in the footsteps of famous visitors such as Mark Antony and Cleopatra, and the apostle, St Paul. 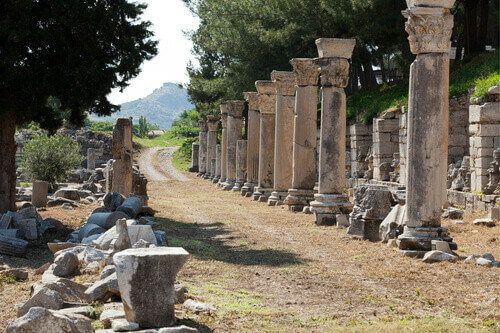 One quarter of Ephesus is estimated to have been excavated, with its an array of attractions located in 4 sq km. 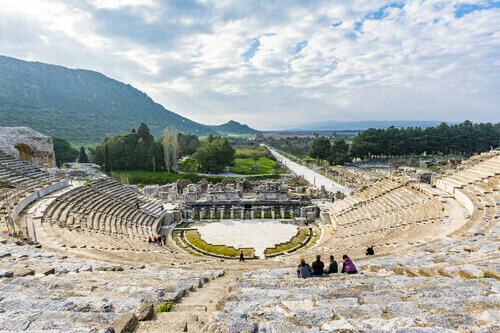 The timeless beauty of Ephesus’ amphitheatre is difficult to miss in every sense: carved into Panayir Hill during the Hellenistic period and designed to hold 25,000 spectators, it was later modified by the Romans but still serves its original purpose, occasionally hosting concerts by contemporary artists. It also holds links to early Christianity, as it was the site of a riot that resulted in St. Paul fleeing the city. 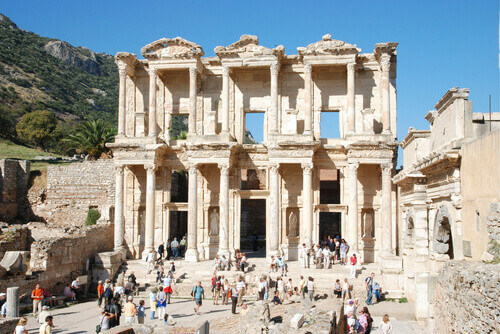 A short walk along Harbour Street – the 530 m stretch from which many of Ephesus’ tourist attractions are accessible – is another popular destination: the Library of Celsus. Built during 1 AD by the Romans to honour the senator Tiberius Julius Celsus Polemaeanus, its façade houses impressive replicas of its original statues, each of which embodies a Roman god said to reflect Celsus’ virtues: knowledge (Episteme), intelligence (Ennoia), excellence (Arete) and wisdom (Sophia). Its two-storey, east-facing Corinthian structure is striking both during the daytime and at dusk, when its numerous archways are illuminated. To explore its structure is to learn about the Romans’ ingenious architecture and culture. Another site that memorialises Roman life is the Gymnasium of Vedius, often referred to as the Theatre Gymnasium or Harbour Gymnasium, because it is also accessible from Harbour Street. Walk its grounds surrounded by lush green hills to see the remains of various rooms and spaces used for exercise and learning. It is part of the gymnasium-baths complex that has been partially excavated. The Scholastica Baths are the largest and most impressive structure of their type in Ephesus, preserved after being rebuilt during the Byzantine period, three centuries after their original construction. Its bricks become a vibrant red when basking in the Turkish sunshine, alongside its maze of columns and walls that survive as the remnants of a structure that was estimated to be three storeys high during its heyday. 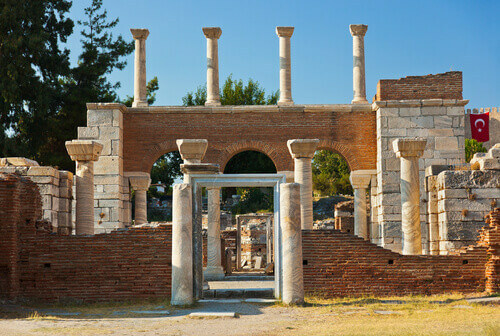 Ephesus also boasts sites that can be studied like chapters in the emergence of Christianity, such as the Church of Mary and House of Mary, an ancient cathedral and shrine respectively, which are both popular pilgrimage because of the era that they document and celebrate. Meanwhile the Basilica of St. John still stands as a tribute to the final years of the apostle, another noteworthy addition to Ephesus’ remarkable living history lesson.